Welcome and Hello, I am Maggie Pollio, Piano Consultant. I am sure you arrived here because you're looking for a piano for your home. Many visitors wonder if I have a piano store full of piano inventory to sell? The answer is YES! Let me explain, I am connected to one of the largest, most reputable piano dealers in the Houston market. This connection affords me the opportunity to deliver to my customer's high-quality pianos, affordable pricing with all of the services you expect, such as a guarantee, delivery, and tuning. 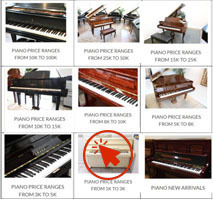 I also have a connection with qualified private sellers who wish to sell their pianos as well. The NO is, I do not own the store nor do I own piano inventory. I do own more than 26 years of piano industry experience and knowledge. I am frequently invited to visit piano factories, piano showrooms, piano trade shows, and conferences as a part of my continuing education. This translates my focus to match the right piano to your budget and playing preferences. In my 26 year career in the piano industry serving Houston and surrounding Houston cities, I maintain a fresh perspective. I sincerely understand the complexities with your journey to own the right piano. Everyone’s piano buying story is special and unique I would love to hear yours, reach out to me at 832-594-7267, call/text or email, maggie@chinesepianolady.net. A little over a year ago I had an idea. The idea was to share the passion, dedication and unique stories our of local musician community. To date, we have interviewed well over 30 highly talented musicians, composers, and teachers. Each interview is truly different, as we explore their musical background, influences and work as a musician. Our project started out with me reaching out to the musicians, interviewing and my brother, Kevin Hsieh, a professional videographer, adding a professional touch to our interviews. I am happy and proud to report that the project has grown. My husband, Jerry Pollio, now manages the musician interview schedules and the actual interviews. We’re all having too much fun! Are you a musician with a unique story to tell? Would you like to speak directly to our audience who I am sure would love to hear your story? Our project is grassroots, community-focused in the hopes of getting your story and message out to a music-loving community. If so, please reach out to Jerry at jerry@applausetothemusician.org! Our technicians will certify that the piano has met our stringent quality checkpoints listed here so you can purchase with confidence. All of our pre-owned inventory is backed by our 10-year parts and one-year labor warranty! Over the last 26 years, I have developed strong professional relationships with Piano Teachers throughout Houston and many of them are in bilingual - English & Mandarin. Please ask me for suggestions; I would be happy to assist you. Interested in a new or used piano? We manage a large dynamic inventory that changes frequently. There is also the option to rent a piano. Call or Text 832.594.7267, email maggie@chinesepianolady.net for details. A grand, upright or a beautifully restored piano? We have them all! Our inventory changes frequently - Call, email or text me for updates. Pearl River Piano Owner – Donna C.